Three strangely conflicting facts that may help to confirm a thesis expressed in "The Wealth of Nations," that nations have somethings that they are better at than others, and perhaps the main cultural theory of Timothy Takemoto (me). Much computer hardware is made in Japan or by Japanese companies in Asia, or at least by Asians. In many areas of hardware, the Japanese take the lead. Toyota will soon put Ford and General Motors out of business even in the United States. General Motors sells hardly any cars in Japan, other than the occasional opel, to my wife. On the other hand, generally, Japanese software is poor. There is no Japanese operating system, no popular Japanese spread sheet software, and the only well known Japanese word processing software "Ichi Taro" is losing fast to Word. Even the Kanji input software Atok is fighting to survive against Microsoft's "IME." There is one area of software where the Japanese lead the world: video games. 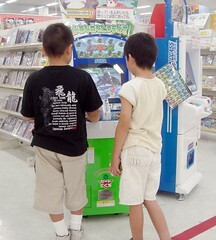 North Americans use the phrase "do nintendo," to describe the act of playing with a video game whether the software was created by that Japanese company or not. Why are the Japanese good at making computers, cars, and video games, but bad at other forms of software (and banking)? I claim it is because they are good at things that they can see, whereas Westerners are good at things that can be said. Thank you reinis ivanovs. I have corrected "loosing fast."